Specifically designed to be used to open the lockway mechanisms on the hoistway doors of stuck and/or malfunctioning elevators, the Elevator Key Set is versatile enough to handle a wide range of elevator doors that correspond to specific types of elevators. 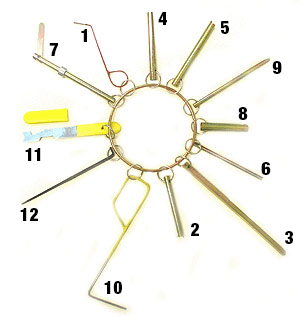 Manufactured to conform to the majority of elevator manufacturers’ access keys, the set is attached with split rings to a five-inch jailer’s ring for easy key removal, storage, and use. 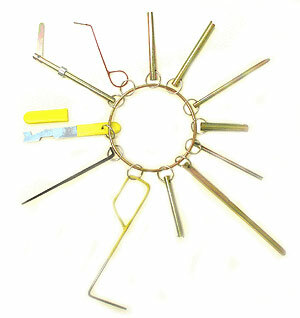 The keys are hard-anodized in gold-color plate to resist rust. Having our Elevator Key Set on every fire truck that responds to commercial and residential buildings is a wise idea, seeing as how many modern-built, residential, and commercial structures are being installed with elevators. Don’t assume anything: Just because your fire company is not situated in an urban area or an area without a large commercial base, it doesn’t mean that the surrounding structures won’t be able to or won’t be equipped with elevators. In addition to assisted-living facilities and nursing homes, a large number of contemporary homes with occupants that have disabilities or special needs are specifically designed with elevators to help them move about more easily. Make sure you’re prepared to handle elevator-related rescues. For more information and to get yours, be sure to visit TheFireStore.com.